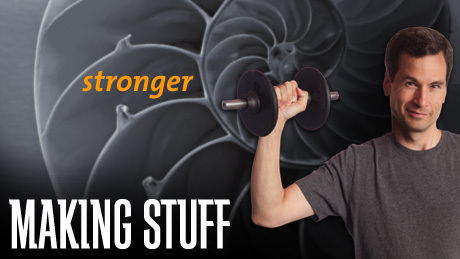 We like the new “Making Stuff” series on PBS that just kicked off last week. Perhaps the weirdest part was watching spider silk come out of genetically-altered goats. We also saw the making of a little black wafer dubbed a “nanotube forest.” (To make it, a special mix of gases plus a catalyst were heated in a 1500 degree furnace. ) If each tube in the forest was an inch wide, instead of being microscopic, it would be two miles high. Pulling on the wafer, the show’s host, New York Times columnist David Pogue, was able to keep pulling out a thread like a long piece of yarn. With a low angle, it looked like he could keep pulling forever. The stuff is stronger than steel and could someday be used to build a bridge across the ocean or a geodesic dome over a city. The show explored different kinds of strength. Pogue stood on a tiny wood plank supported only by four pieces of ordinary chalk, which break apart when you flex them but have extraordinary compressive strength. The same trick was done on wine glasses. At first four glasses supported his weight, then three, two, and finally only one, with a small wood plank on top. The spider-milk goats are turning out a liquid which is two percent silk. It takes a quart to make two or three meters of silk, but that silk is stronger than steel or Kevlar, the material used in bullet-proof vests. The next show, Making Stuff Smaller, airs January 26. In the U.S., you can check your local listings here or watch the first show here.